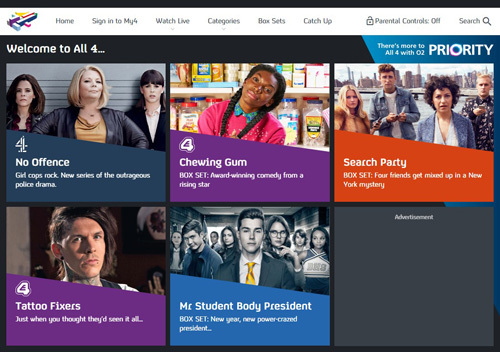 4oD stands short for 4 on Demand and is a video on demand service, covering the needs of all 4 viewers in the United Kingdom. It is alternatively known as All 4 and includes films and other broadcasting content from Channel 4, E4, More4 etc. As you can see, there is great interest in watching such great stuff! In fact, 4oD has transformed Channel 4 into the most popular UK broadcaster over the year and this highlights just how many people wish to enjoy watching these shows. However, due to copyright restrictions applied, only people from the United Kingdom can access the content of 4oD. The others are displayed a message clearly stating that they cannot continue. On the bright side, there are some methods for unblocking 4oD outside UK and everywhere in the world. In specific, you can choose whether you wish to go ahead with VPN, SmartDNS or proxies as your method of unblocking. In this article, we will concentrate on the use of SmartDNS. So, let’s find out which the best service providers are for you to have your pick from! Unlocator: Unlocator is a SmartDNS service provider from Denmark and it has got a wide array of servers in the UK. This leads to the unblocking of multiple channels from Britain, including of course 4oD and all 4 channels. Thanks to its affordability, you may find it simple and convenient to subscribe to its services and enjoy unblocked content of 4oD on any device and OS. You will not need to install any type of software for using Unlocator. This can be proven extremely helpful, in case you are not that tech literate. Plus, you can get the SmartVPN feature and find a solution, even when SmartDNS is not available. Great help and support, always eager to help out and make your user experience as good as it gets. Unblock – US: Unblock US is another reliable SmartDNS company, based in the Barbados and having another branch in Cyprus. In the United Kingdom, there are multiple servers that can help you out in your effort to unblock 4oD outside UK. Full compatibility is of course a plus, as is the great value for money that you get from subscribing to its services. Setup and use are easy as pie, even for people who do not know about computing. The SmartVPN feature is available in Unblock US, as well. Help and support are thorough, adding to the overall experience. If you wish to unblock 4oD, this is an excellent choice! TrickByte: Moving on, we find TrickByte. This is a company from Thailand, having already expanded its network of servers. UK servers are solid and will allow you to unblock 4oD outside United Kingdom without any problem or delay. Among the major advantages, we find 14 days of free trial and great price rates, only $2.99 per month. When it comes to help and support, there really is nothing lacking. With an impressive set of servers and at such low prices, TrickByte truly makes a difference. You can enjoy this service on any device, no matter which Operating System you currently use. Smarty DNS: Next on our list is Smarty DNS. Unblocked channels from the United States and the United Kingdom, Germany, Poland and Canada offer a wonderful experience to you. More specifically, since you are interested in unblocking 4oD outside UK and everywhere in the world, the UK servers will satisfy your needs and live up to your initial expectations. You can also benefit from a free trial and full money refund guarantee, no setup installation required and full compatibility. Last but definitely not least, there is great help and support for making things even better. Smarty DNS is really one of the finest choices you can get for UK unblocked channels like 4oD. OverPlay:OverPlay is the last SmartDNS service that completes our list. Located in the US, it has got a prestigious network of servers for you to try out. UK servers will enable you to go ahead with unblocking 4oD outside United Kingdom in a jiffy. Unique value for money is a bonus for subscribers, especially if you choose to subscribe to the yearly plan on offer. In addition, there is full compatibility with devices and OS and this is amazingly convenient. Another thing to keep in mind is the fact that you can combine SmartDNS services along with VPN at OverPlay and have the benefits of both in one subscription. Help and support will never fail you, of course. Now that we have finished analyzing the 5 best SmartDNS services for unblocking 4oD outside UK and everywhere in the world, a few words need to be said about SmartDNS itself. Why is it better than the VPN? Which are its benefits? Well, the truth is that there is no encryption involved in the process of SmartDNS. This automatically means that you get no loss of speed or quality deterioration throughout your live streaming. In addition, SmartDNS is really easy to setup and use, without any software needed to be downloaded. It is affordable, generally cheaper than the VPN. It can be used on any device and OS, thanks to its incomparable compatibility. All in all, it is a convenient way for unblocking channels that would otherwise be out of reach to you. No matter which of the 5 best SmartDNS service providers you select to use for unblocking 4oD outside the United Kingdom, be sure to follow the instructions given carefully. As a result, you will be able to enjoy premium quality content on any device, without worrying about geographical restrictions and copyrights any more. Take full advantage of what SmartDNS can offer you and have fun!